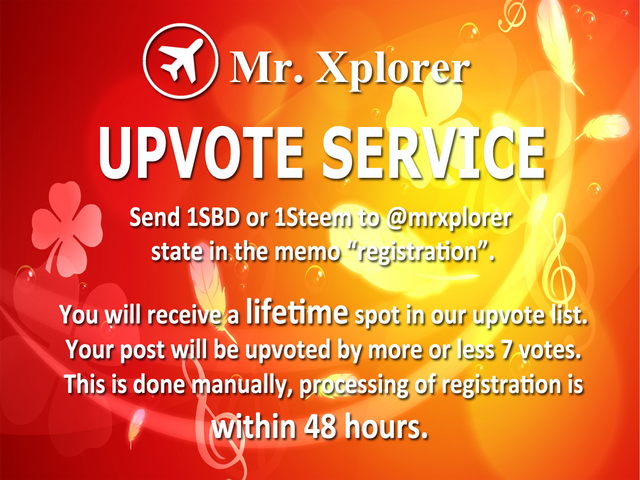 What Is Mr. Xplorer Upvote Service? Any Steemians who will enroll in this service will be included in the upvote or curation list of @mrxplorer with a trail votes from more or less 7 curators. The curation trail may increase as more Steemians are willing to follow our curation trail. Since the service is just starting the accumulated value of the curation upvotes may vary from $0.005 to $0.01. Starting Steem Power of @mrxplorer is 30SP. As more members arrive, our Steem Power will increase as well. We will allot 75% earnings of this service to power-up @mrxplorer account to help our community not only upvotes but also get higher vote value. As our curation rewards increase @mrxplorer will get stronger every day. Congratulations! This post has been upvoted from the communal account, @minnowsupport, by unlisteem from the Minnow Support Project. It's a witness project run by aggroed, ausbitbank, teamsteem, theprophet0, someguy123, neoxian, followbtcnews, and netuoso. The goal is to help Steemit grow by supporting Minnows. Please find us at the Peace, Abundance, and Liberty Network (PALnet) Discord Channel. It's a completely public and open space to all members of the Steemit community who voluntarily choose to be there. To see why 2932 Steemians use SteemPlus, install our extension, read the documentation or the latest release : SteemPlus 2.17.4 : Two new features on Busy and bug fixes.